Well first and foremost this is the car i drive, but it does not mean biased, my style is to be direct regardless of if its my drive or not! So what is a Stream, reason i am stating this is that the Stream is a rather rare vehicle in Sri Lanka, specially the cool RN6 version. The Stream is based the FD-series Civic with an extended wheelbase, and what is categorically defined as the MPV version of the Civic, though in today’s term its more a “crossover” vehicle. While Honda marketed the RE series as a MPV, the RN series marketing was more sporty, and it said Family coupe.. and you know what, i think that might be a correct definition, coz it definitely looks cool to be called that. UPDATE (2-Feb-2014): When i came to part replacement is when i noticed that the Stream and the Crossroad are identical, which makes sense since they are identical vehicles with the same chassis, except that the Crossroad is designed to look like and SUV, while the Stream more car like in design. The Stream is also more spacious in that it has a longer overall length (hence you actually have a small boot when all seats are up, in the Crossroad there is zero boot space with all seats up), and the Stream also has more head and leg room in the second set of rear seats! So from a family point of view i can see why the Stream was more popular and continued to sell for many more years unlike the Crossover which was discontinued in just 2+ years in Japan. The design to me is really the key part of the RN6 Stream, as the older generation vehicle looked far too van like. The RN6 Stream nose is aggressively and masculine, and also very different from the rest of the Honda range. Initially it looks very different from the FD Civic that its based on, however when you park the car beside one you see both have the same side flanks, and its just the headlights and front grill that makes the cars look drastically different. See http://specs.cars-directory.net/~compare?ids=NDMwMjEsNTQyOTQ= for a comparison with the equivalent FD series Civic. The side profile is also very neat and hides the fact that its an MPV. Loads of my mates mentioned that they don’ t mind owning a MPV if it looks cool as this. In comparison vehicles such as the rival the Toyota Wish,and the more common Kia Carens. The rear has some design elements lifted from the RD series CRV, and is less unique than the front design. But still a very nice job specially when you compare it against most other MPVs and estates. The Stream amazes many by the very efficient interior space. The car though having a 40mm stretch in wheelbase over the FD Civic, has shorter overhangs, so remains nearly the same in length but has vastly greater space. The vehicle can easily seat someone as tall as 5′ 8″ in the 2nd set of rear seats in comfort! The middle seats also have very good legroom, and are also very nicely contoured. However a design element Honda has missed is that they have maintained the same door control layout for the rear, which means you have a 3″ jut in from these handles which reduces the interior width of the car. With most Japanese cars having to constraint themselves to 1695mm in width, the designers should try to maximize the interior width for the middle seat so that that 3 adults can sit in reasonable comfort, or be able to allow an adult to sit with two car seats which can be a challenge with the Steam (and many other cars). Making the middle seat controls on the door leaner to say 1″ thick, or placing the on the door would have made this an awesome fully capable 7-seater. For now i would say its more a 6-seater unless you have 3 kids seated in the middle row seats. Boot space with the last row folders is good, but once the seats are up the boot space is very minimal. However i was surprised when i saw the Kia Sorento and the Mitsubishi Montero Sport, two popular 7-seaters in Sri lanka, also have the same volume of boot space when the second set of rear seats is up. This shows how efficient Honda has been with the interior design, since the vehicle has a much shorter wheelbase than the two other vehicles. Surprisingly for Honda, the method of getting into the 2nd rear seat can be a challenge as you have to bend and climb, and i would have preferred the fold and drag front style (as done in the Kia Sorento) which is way more easy. Mazda opted for the sliding door with their Stream competitor the Premacy, but this makes the Mazda look more like van in design, which would put off most sporty crossover owners (like me!). The car definitely is heavier than the FD civic due to the extra bulk, but still the engine has enough zist to keep the smaller 1.5liter engines at bay. The RSZ spec seems to have a different gearbox to the standard auto, which helps on the performance end. The paddle shift is an useful addition, and is definitely needed since like any single cam VTEC engines, the low end grunt is lacking, and you need to shift through your gears to get the vehicle moving, though once it is into the 3rd gear there is more grunt especially in S mode. Update (Jan-2015): The gearbox I am getting the feeling is actually sourced from an Accord, which may explain why its smooth and quite advanced. Also unlike the FD Civic, this has a normal auto gearbox. The FD Civic 1.8 and 2.0 vehicles have the CVT gearbox that has problems, the normal gearbox on the stream means no such issues as long as you change the oils at the said intervals. However after test driving my colleagues FD civic, one area the Stream definitely has an edge is that ride and composure. The ride is more compliant even though the RSZ comes with a more sporty suspension, and also handles rutty gutted roads a lot better. The additional weight and extended wheelbase also helps in the area of handling, where its more resolved than its sedan counterpart. Update (Dec-2013): The car has very good acceleration up to around 140-160kmph but after this you notice the vehicle acceleration drops dramatically and its up to the stretch of the road to get more speeds, though if you step on the pedal it is quite capable of picking speeds well above 170kmph. Update (Feb-2014): I finally found a site that had done some performance test of the Stream, the car is rated at 9.8-10 seconds to 0-100kmph. This makes it quite nippy for a car carrying a fair amount of weight. The performance of 0-140kmph is also the more important benchmark, as that’s where the more power and larger capacity engine outperforms the 1.5 liter cars that all offer decent 0-100kmph performance, but then trail off. The impact of the additional weight of the vehicle is felt in city driving. The key reason i noted is that the eco mode of the engine is over 10oorpm and under 1800rpm, a range which is hard to maintain in city conditions. 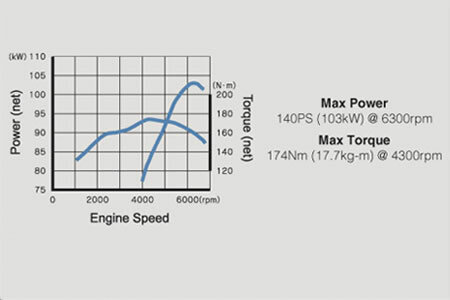 The engine power and torque graphs i got from another blog site gives you the idea. Max torque is only at a rather high 4300rpm, which might seem comparable since the Toyota 1.8 VVTi engine also has a max torque at 4400rpm. But the difference is that the Toyota engine is able to provide a more flatter (less revvy) torque distribution at the lower end that helps it maintain attain the economies while delivery near similar performance. Surprisingly the fuel economies of the Stream are pretty identical to the 150kg lighter 1.8L FD-series Civic, indicating that its engine performance impacting city driving fuel economies more than anything else! Come on Honda, lets have the dohc engines on the range shall we if not the city driving economies of the Honda’s are definitely not going to match the Toyota’s which seems to have oozes of pulling power with minimal RPM that helps them achieve those great fuel economies. Update (Dec-2013): If i drove the vehicle around 110-120kmph which seems to its optimal speeds i clocked an indicated 14-18kmpl. Update (Oct-2014): Drove on the southern express on a very rainy day, and I was mighty impressed on the stability of the vehicle in wet weather. I had managed to keep up with many cars that were more powerful, and only gave way for a Freelander LR2 SD4, BMW E90 320d and a 520d. However i found both bimmers and the Freelander slowing down as the weather got rainy, and i had no problems driving on these conditions. Needless to say i left the bimmers and the Freelander behind as i kept my phase on the wet weather. Update (Jan-2015): Took another trip on the Southern highway, and this time with 5 adults and 2 kids, and the car did 170kmph, indicating it still has the legs. I have now owned this vehicle for almost 2 years, and the vehicle had been run in Japan for 3 years prior to my ownership. The vehicle has over 80,000km on the odometer, and is still running with the original shocks which are in good condition. I changed the original Yokohoma tires which seemingly had lasted almost 70,000km which is impressive, but sadly i could not find the identical tires here locally. I had opt for the Kumho tires and that too a 215/55/17 as opposed to a 205/55/17 which was the original spec on the car. UPDATE (Dec-2013): The Kumho tires were about 85% wasted (and i had done 28K on the tires) when the tire shop mechanic noted during the tire rotation that there was an unusual split on both the tires in the middle and he advised to replace them. I then went to the dealer i brought it from (U&H Tire shop) and the sales chap who knew me when said lets ask the agent and see if they can provide you a replacement. I was then routed to DIMO, who initially said nothing was wrong, and that i could drive safely until the tire wasted. However i responded back saying the tire dealer had said this is a danger, and if they can vouch for the safety. They promptly then said they will check with the overseas branch and a week later they provide me a full 50-60% discount on top of the discounted rate and sent me two NEW Kumo tires (newer version of what i had). While initially not impressed by the service, i must say that its good to see them honoring the warranty that we normally take for granted! Brake pads in the front were changed at 70,000km and i am not sure when the previous owner had replaced the brakes, but i am now into around 10,000km an the brake pads are in good condition. However i see a tendency for the rear brakes to be used a lot, not sure why. The air filters required regular replacement mainly due to the very dusty conditions in my my area, where the vehicle is regularly soaked in dust and this causes the air filter to get dirty very quickly, and the impact of a dirty air filter is easily noticed on the pulling of the vehicle and the fuel economy. One thing that has annoyed me with my Honda Fit and the Stream is that the front head lights start to pick a slight yellow hue, even though they are on stock bulbs, and this ruins the appearance of the car. In addition with the Stream i noticed some scratch like marks which are internal appearing in the front lights, i am not sure if this is a problem due to the higher temperatures and humidity in Sri Lanka compared to Japan. However with the Stream sold in other Asian countries i am sure Honda should have designed for these challenges. UPDATE (2-Feb-2014): The odometer reading is now 105,000km, and the car is still solid. From maintenance cost, i finally changed the shocks, since this car is not brought down by the dealer i had to get the shocks down. The cost quoted by Stafford the agent was “crazy” and they wanted 3+ months even to get it by air freight, and i got the same original shocks down through the popular TechMotors for much less. However though i felt the shocks were wasted, the mechanics when replacing indicated that i could have run more (i guess what they say wasted is not to my standard)! However i proceeded with the replacement since they had removed the units. UPDATE (NOV-2014): The rattling front rack was driving me nuts, and finally ordered it and replaced it as well as the stabilizer links. I feel the agents diagnosis of the shocks being bad were wrong, it was actually the stabilizer links as the car now feels like new, and with the new rack its really like a new car. UPDATE (Mar-2015): The odometer is now reading 114,000km, so a light year as i have done just over 9,000km only for an year, and mainly in cursed Colombo traffic 😦 I started getting a bit of humming noise, and the check with the agents mentioned that it was the wheel bearings. I have ordered them ,and hope to replace them shortly. Reviews of this vehicle is harder to find, since the RN6 was not sold outside the Asian market unlike the RE series Stream. Main reason being not to cannibalize their Civic and CRV sales, as the Stream and Fit together effectively took the Civic out of the Japanese domestic market! Previous PostHonda Civic Hybrid FD3 Sedan quick reviewNext PostCheap (Chinese) Android Tablet devices any good? I had the same challenge and fear (of breaking it by applying too much force) a few weeks ago… but alas, applying more force is indeed the only way. You need to give it a series of tugs for it to be freed from the clips underneath.. Good luck. Hi, the stabilizer links change to overcome the rattling, are you referring to this item : http://img.rnudah.com/images/95/9587715181.jpg ? How can I change the radio from Japanese to English? If you managed to change can you share how. We have the streams here a lot in Jamaica , they are nice cars,where can I get a workshop manual? I posted two workshop manuals on my stickie. Only on the engine itself, the R18 and the K20. Broadly base on the Honda Civic. I was dreaming of importing a Stream 1.8 and then settled for a Fit GE6 instead recently. But I still love this car! Well i nearly went and got a GE6 but the extra seats made me switch to the Stream, but the impact on the pocket due to less fuel economy is felt on everyday driving 🙂 But must say the car is definitely fun to drive, and I am quite impressed by its handling and composure.